45mm 18K rose gold case, 15.18mm thick, with see-through sapphire crystal back, 18K rose gold and stainless steel crown screw down, sapphire crystal, black dial with luminescent numeral, hour markers and hands, Caliber 03.05-M automatic movement with chronograph, flyback function, tachometric scale, stop seconds, hours, minutes, small seconds, date, chronograph seconds hand, 30 minute counter and 12 hour counter, approximately 60 hours of power reserve, black rubber strap, 18K rose gold folding buckle. Water resistant to 100 meters. 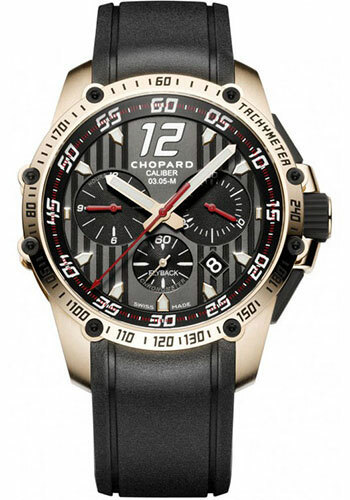 45.00 mm stainless steel case,tachometer scale engraved bezel , screw-down crown, black dial, automatic self-winding COSC movement with hours, minutes, small seconds, date, chronograph's hand, 30-minute counter, and 12-hour counter, approximately 42 hours of power reserve, rubber Dunlop racing tyre 1960s design strap. Water resistant to 100 meters.